William Ross Stilwell was wed to Mary Fletcher Speer (known as Molly) on 8 September 1859 in McDonough, Georgia, in Henry County. William was twenty and Molly was eighteen. Having moved to northwestern Louisiana and having their first child, they returned to Georgia in 1861 so Molly and their son Tommy could stay with the family while William joined Company F of the 53rd Regiment Georgia Volunteer Infantry in May 1862. The 53rd Georgia, on reaching Virginia, was immediately assigned to the brigade commanded by Paul Jones Semmes, a wealthy Columbus banker. The brigade was later commanded by Goode Bryan and then by James Philip Simms. The 53rd Georgia was in the Corps of James Longstreet and fought at Antietam, Chancellorsville, Gettysburg, the Wilderness, and Cedar Creek. 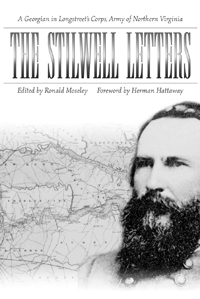 Stilwell maneuvered for a special position and consecutively held positions of brigade headquarters guard, assistant to the brigade quartermaster, and finally brigade courier. Throughout the war, he maintained daily contact with company F. Collected here are 127 of his letters, most written to Molly. He wrote her about once a week for two and one-half years.